The Khartoum School was formed by the painters Ahmed Shibrain, Kamala Ishag and Ibrahim El-Salahi. 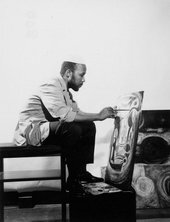 As one of the most active contributors to the growth of modern art in Africa, the group was typified by its use of primitive and Islamic imagery. One of its distinctive characteristics was the use of calligraphic writing, in which the artists would simplify Arabic script into abstract shapes. This aesthetic, called hurufiyya, together with Islamic motifs, became a hallmark of the Khartoum School. The group disbanded in 1975 after Ishag broke away to found the Crystalist Group and El-Salahi was accused of anti-government activities and imprisoned, later going into self-imposed exile in the UK.